What types of Gadget does a Switched On Insurance policy cover? What is covered under our gadget policy? What happens if an incident happens and the Switched On call centre is closed, i.e. such as at the weekend? Gadget insurance is a cost effective way to insure the gadgets and electronic devices that form part of our everyday lives. It is only when something goes wrong that we truly understand their value, not only financially but personally and the inconvenience that can be caused. By purchasing Gadget Insurance you can mitigate the financial risk of your gadget becoming broken, lost or stolen which may include not only the cost of the gadget its self but also any additional costs incurred such as through unauthorised usage which may otherwise leave you with a large phone bill to pay possibly up to £1000 or more. Q. What types of Gadget does a Switched On Insurance policy cover? Mobile Phones, Smart Phones including iPhones, Laptops including MacBooks, Tablets including iPads, Desktops including iMacs, iPods, Digital Cameras, PC Monitors, MP3 Players, DVD Players, Games Consoles, Video Cameras, Camera Lenses, Bluetooth Headsets, Satellite Navigation Devices, PDAs, E-Readers, In-Car Computers, Head/Ear Phones, Wearable’s (such as Google Glasses or Smart Watches). Q. Is there an age restriction on the Gadget(s) that I can insure on a policy? 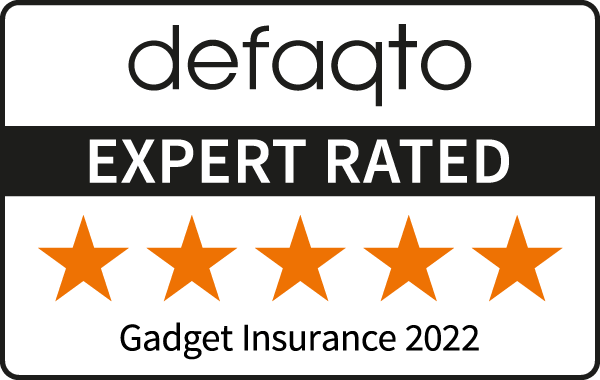 Once you cover a gadget with us however you can continue to insure that gadget for as many years as you like by paying your premium each month or renewing your policy each year. So even if you are currently insured with another provider, or are at the point of your annual renewal, as long as the device is less than 36 months old when you first register the device on the policy you can cover it on a Switched On Insurance gadget policy. Q. What is covered under a Switched On Insurance gadget policy? As we do not offer advice we provide variable levels of cover so you can choose the product that best suits your individual requirements. Breakdown - We will repair or replace your gadget if it suffers breakdown, providing the gadget is returned to us. Please note that this cover only applies if the breakdown occurs outside the manufacturer’s guarantee period. Unauthorised Usage - If your gadget is lost or stolen, and the loss or theft is covered by your policy, we will refund the cost of unauthorised calls, messages and downloads made from it after the time it was lost or stolen up to a maximum of £2500 (including VAT). Theft - If you suffer theft of your gadget we will replace it (in respect of a valid theft claim). Loss - If you accidentally lose your gadget we will replace it (in respect of a valid loss claim). Worldwide Cover - Cover is extended to include use of the gadget anywhere in the world, for up to a maximum of 120 days, in any one year depending on the policy selected. The policy extends cover to immediate family, including your spouse, partner or parents or your children, brothers or sisters who permanently reside with you. Your policy is instantly available for you to download once payment has been taken. A link to download your policy documentation will also be sent to you via the email address you provide us. Please note that some internet providers may accidentally filter our automated e-mails as SPAM so please check your SPAM/junk folder if the e-mail has not been received. You can also login via the website and download your documents at anytime. If you are having trouble accessing your documents and need help, please email us at gadget.sales@SwitchedOnInsurance.com and we will assist you. Protecting your Gadget is quick and easy. Insurance can be purchased online with immediate cover, simply get a quote. Card payments and all other types of payment will be collected by Taurus Insurance Services Ltd (trading as Switched On Insurance). The name Taurus Insurance Services Ltd may appear on your credit or debit card statement. Q. How is Taurus authorised to take Direct Debits / payments from my bank account? When you accept to purchase an insurance policy via www.switchedoninsurance.com and choose the Direct Debit payment option you are required to complete a Direct Debit instruction either online or manually by downloading and printing our Direct Debit Mandate form. The Direct Debit instruction to your bank authorises Taurus Insurance to take these payment(s) on our behalf. All Direct Debits are backed by the Direct Debit Guarantee. Taurus Insurance will send you confirmation of your direct debit payment(s) schedule in by email once the Direct Debit is set-up. A Direct Debit is an instruction from a customer to their bank or building society authorising an organisation to collect varying amounts from their account, as long as the customer has been given advance notice of the collection amounts and dates. In accepting insurance from Switched On Insurance, you have agreed that we send your personal and bank details to the insurance administrators to enable us to arrange for your gadget to be insured from the moment your insurance has been accepted. What is an excess? If you make a claim you are liable to bear some of the cost of repairing or replacing your gadget and the insurer bears the rest. All insurers do this to ensure that the policy holder carries some financial risk and is therefore encouraged to take reasonable care of their device. Switched On Insurance has worked with our Insurer to keep excesses low for the majority of gadgets. Annual policies: As per your Certificate of Insurance, if you have chosen an Annual Policy your period of insurance is 12 months from the date of purchase or renewal. Upon cancellation, cover will terminate immediately and providing you have not made a claim you will receive a pro rata refund of the premium (subject to your 14 day Statutory right to cancel). For any cancellations after 14 days of the insurance policy purchase date we will charge an administration fee of £15. Please note: If you do cancel your policy, your gadget will no longer be covered against any of the eventualities that your policy covers. Simply login to your account via the Switched On website or contact us and we will be able to send you a duplicate copy of your documents by email. You can contact our claims helpline on 0330 880 1746 (local rate call). Lines are open Monday to Friday 9am - 5:30pm. Q. What happens if an incident happens and the Switched On call centre is closed, i.e. such as at the weekend? We welcome all queries and questions. Please see our contact us page for more details.